January 11, 2019 – Baffled and a bit anxious about helping your children use the library? You’re not the only one! Arcadia Public Library’s Children’s Services Department is offering a stressfree, useful workshop on “Navigating the Jerry Broadwell Children’s Room,” on Monday, January 28, at 6:30 pm. Participants will take a tour of the Children’s Room and learn important tips for finding all the resources their young readers need for learning success. For more information, please call 626.821.5566 or visit the Arcadia Public Library’s website at www.ArcadiaCA.gov/library. The Arcadia Public Library is located at 20 W. Duarte Rd., Arcadia. The Library is open Monday through Thursday, 10:00 a.m. until 9:00 p.m. and Friday and Saturday, 10:00 a.m. until 6:00 p.m. You can also follow the Library on Facebook and Twitter. Nestled along the rolling foothills of the San Gabriel Mountains and Angeles National Forest, Arcadia is a charming, family-oriented community with a population of just over 57,000. Located only 13 miles east from downtown Los Angeles, regional transportation networks like the Metro Gold Line connect Arcadia as a premier residential, shopping, and entertainment destination in the San Gabriel Valley. Arcadia is known for its top-rated schools, iconic landmarks, and serene neighborhoods. Arcadia is an award-winning community having been twice named as the Best City in California in which to Raise Kids and the 2017 Most Business Friendly City in Los Angeles County. With the conveniences and amenities of a full-service, mid-size city, Arcadia’s “Community of Homes” provides a quality of life that will go Above & Beyond your expectations. 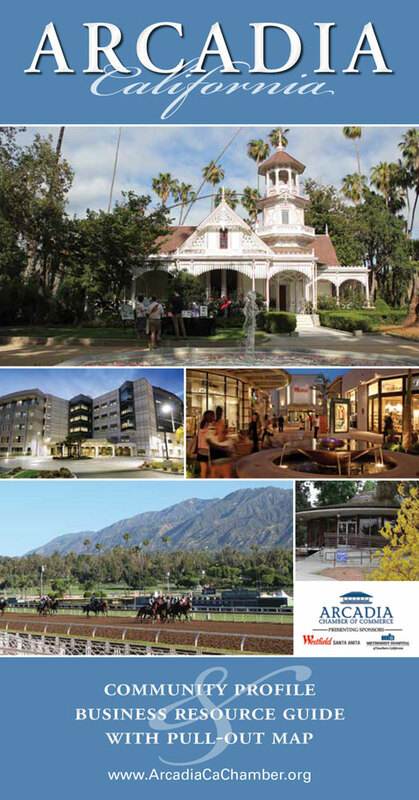 Read the new city of Arcadia community profile, complete with a business resource guide and a “pull-out” map. View the city of Arcadia Community profile. Receive our latest news and events.